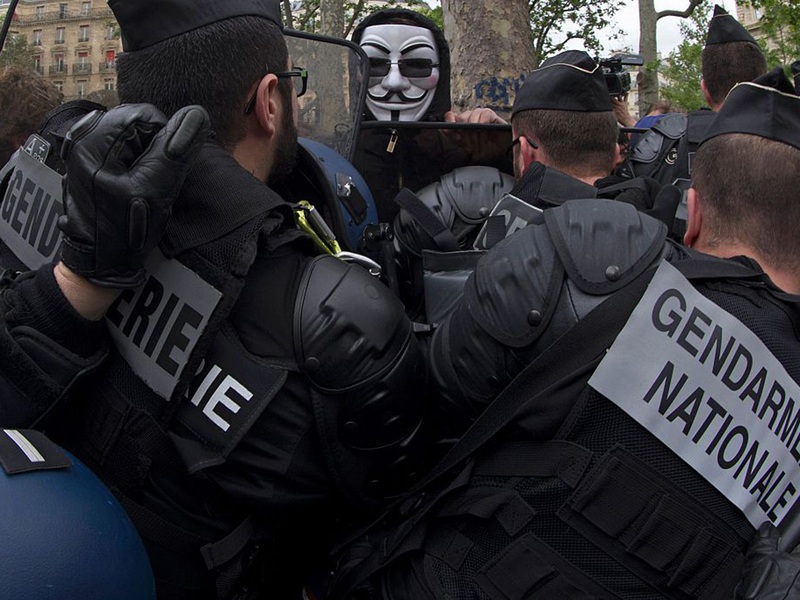 PARIS - French police took to the streets in about 60 cities Wednesday to denounce the hatred and violence they say has been repeatedly directed at them during protests against the government's labor reforms. In some places they faced counter-protesters, who said the police themselves were instigating the violence. In Paris, a few hundred police officers gathered on the Republic Plaza during their lunch break. Several hundred counter-demonstrators came by, chanting slogans like "Everybody hates the police!" and pushing up against the officers until eventually the police deployed pepper spray to disperse the crowd. Some counter-protesters set fire to a police car in a street nearby. Vanina Giudicelli, one of the counter-protesters, told The Associated Press that the police gathering was "a real provocation." "Since the first demonstration on March 9, we notice that they generate the violence. We have been sprayed by gas, hit with batons, arrested," she said. Jean-Claude Delage, secretary general of the Alliance police union, denounced an "escalation of violence" in the labor protests and said some people were harassing police officers with projectiles and Molotov cocktails and even hitting them with iron bars. "Troublemakers provoke clashes in the middle of peaceful protests. So it's very complicated for police forces to isolate and arrest them," Delage explained on BFM television. French President Francois Hollande said Tuesday that over 350 police officers have been injured in clashes and 60 people have been convicted amid the labor reform protests. French Interior Minister Bernard Cazeneuve says he is offering his "full support" to police following the weekly Cabinet Council meeting. He said the police have instructions to take "firm action" against those who take part in violent clashes. "Anti-cop hatred comes from a small portion of the population ... but these 10 percent are very violent," Jean-Marc Falcone, general director of the police, told Europe 1 radio.